It is an unfortunate fact that asthma rates continue to climb in almost every demographic. Some studies have revealed that over eight percent of the population has some form of asthma or an asthma-related condition. This chronic disease is not always dangerous, but issues involving one’s respiratory system should never be taken lightly. Here is a closer look at some of the most common symptoms of asthma and what you can do to minimize the side effects once you have been diagnosed with it. It is important for everyone to remember that asthma can develop at any age. Some patients are born with this condition while others do not develop it until they are much older. The age at which you develop asthma will dictate how it is treated and what you can do to avoid severe attacks. As a general rule, patients are diagnosed with asthma when they have recurring inflammation of the airways. In some patients, this leads to nothing more than minor discomfort. Others struggle with painful swelling of the airways that makes it almost impossible to breathe. No matter when asthma develops, all patients must receive immediate assistance from their doctor when they notice any unusual issues with their breathing. Symptoms that are often associated with asthma could be caused by another serious medical condition. Failing to treat these conditions as soon as possible might result in permanent damage to the airways or even death. Luckily, most patients who are diagnosed with asthma early on are able to live rich and fulfilling lives by making a few lifestyle changes and keeping emergency medication with them at all times. Asthma can cause a wide variety of side effects, and many patients confuse it for other common medical problems such as allergies or a sinus infection. When an asthma attack first begins, most patients feel tightness in their chest followed by difficulty breathing. You might also become tired or irritable due to a lack of oxygen getting to your brain. Family members and friends should know some of the most common signs of an asthma attack. In many cases, the individual with asthma is not thinking clearly and will not react in time. Those closest to them should key an eye out for coughing, wheezing, and difficulty speaking. Your loved one might also begin to doze off or have a difficult time paying attention to the task in front of them. During a severe asthma attack, patients often grab their chest and complain of sharp cramps throughout their midsection. If you happen to notice any of these signs or symptoms, then you must immediately contact the hospital or administer their asthma medication. Anyone who believes they might have asthma should speak with their doctor as soon as possible. Before you speak with your doctor, however, you should try to write down as much as you can about your symptoms and triggers. Even though your doctor might be able to make an accurate diagnosis with traditional medical tests, the data you give them will improve the accuracy of diagnosis. They will most likely want to know when you have asthma attacks, what you are doing before the attacks occur, how long they last, and what they feel like. Unlike many other serious diseases, doctors generally do not diagnose a patient with asthma until they have ruled out all other possibilities. Most patients receive a full battery of allergy tests to see if any foods are causing chronic inflammation of the lungs or throat. After that, they might test for issues such as IBS, acid reflux, and seasonal allergies. Once those have all been ruled out, they must then carry out a lung test and pulmonary function test to get a better look at your organs. It is very difficult to determine exactly who will develop asthma until they begin showing the side effects of this disease. The single biggest variable to consider is the medical history of the patient’s family. Those who have one or more blood relatives with asthma have a very high risk of developing this condition themselves. Lifestyle habits such as smoking and drinking alcohol can play a role as well. Other risk factors include the patient’s weight, exposure to secondhand smoke, and exposure to occupational triggers. Treatments for asthma general include a mixture of lifestyle changes as well as prescription medication. Controller medication is often seen as the most important style of treatment because it can prevent asthma attacks altogether. This medication is typically a pill that is taken orally once a day. A number of different companies have begun to offer controller medication that only needs to be taken once every seven to ten days. Rescue medication is also important, but it is not taken until the patient begins to feel the side effects of an asthma attack. Most patients receive rescue medication in the form of an inhaler that they will need to use two to three times leading up to an attack. 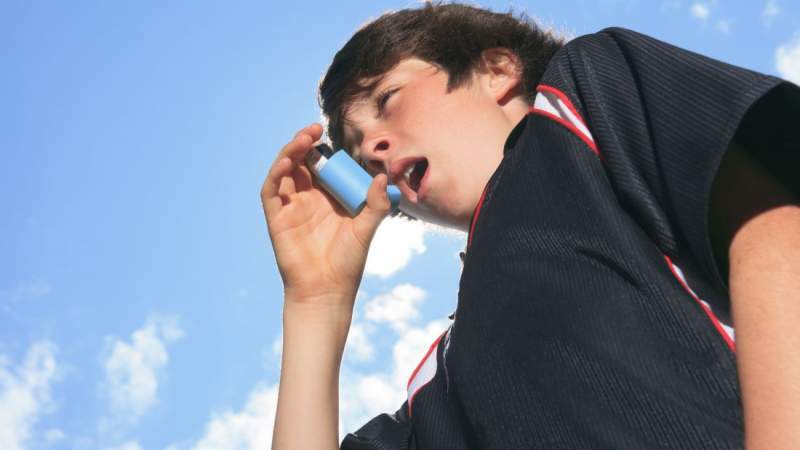 Exercise-induced asthma can be treated in a slightly different manner than chronic asthma. Patients who have been diagnosed with exercised-induced asthma might be eligible for beta-agonist medication that can be taken just before working out. No matter how diligent a patient might be, there is no guarantee that they will never experience an asthma attack again. In addition to professional medical treatments, patients must take a hard look at what is triggering their attacks. One of the most effective ways to minimize the side effects is to exercise as much as possible. Even though exercising is often uncomfortable for asthma patients, it will strengthen their lungs and improve their heart health. In order to keep their weight under control, patients should also stick to a healthy diet. Any extra fatty tissue around the airways can exacerbate the patient’s symptoms. Practically anything that affects an individual’s breathing or heart rate can trigger their asthma. This includes stress from work, allergies, and smoke in the air. All asthma patients should schedule air quality tests for their home and place of business to see if there are any airborne irritants that could be giving them problems. Patients must also be careful of the beauty products they use because VOCs can cause inflammation of the airways as well. While an asthma diagnosis is overwhelming and there is currently no permanent cure, you can still live a fulfilling life with this condition. The first step is to speak with your doctor about controller and rescue medication to limit your risk of a life-threatening attack. You must then begin the process of uncovering your triggers and removing them from your environment. When combined with regular exercise and a healthy diet, these lifestyle changes could be all that you need to avoid future asthma attacks.